Proofs showing judicial monopoly of Yang Seung-tae are coming out one after another from prosecutor’s investigation and additional documents disclosed. However, the court interferes the investigation by rejecting search ad seize warrant on judges involved despite a chief justice promised to cooperate. Hence, PSPD held events of reporting Yang’s monopoly to citizens twice in July and informed people of cases which were subject to trial trade. 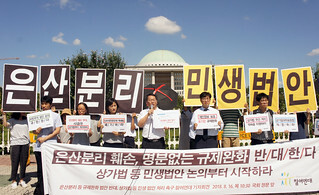 Public hearing was organized regarding a bill of special Act for judicial monopoly which was proposed by a lawmaker Park Ju-min, and press conference was held to urge the National Assembly to pass the bill. PSPD also held an urgent discussion at the National Assembly and talked about facts on judicial monopoly revealed by documents so far. 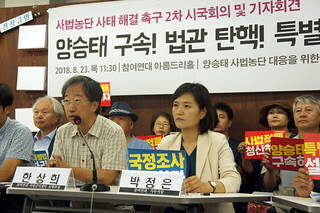 After the first one in June, PSPD and Minbyun held the second forum on current issue and resolved to hold a movement for legislating special Act which enables establishment of a special court which would deal with arrest and punishment of Yang, impeachment of judges involved and cases subject for trial trade. The first step to recover distrust on judiciary will be finding every single black deal made by Yang and giving judicial punishment as much as he deserves. Many people have died from dam collapse which was under construction by Korean ODA. While the cause is under investigation, deep comfort and recovery measures are desperate for residents who lost many things. PSPD and various organizations have formed a task force and urged Korean government and SK Construction to find if feasibility and destroying environment problem raised at the early stage of the project have been fixed and they were asked to support rescue and aids. <Asia Pod> July talked about social conflict in respect to more than 500 Yemen refugees who had to escape from own country because of civil war. The event was held having the first memorial of Rohingya massacre and praying for Myanmar government to admit its responsibility and safe return of 800 thousands Rohingya refugees. The Ministry of Finance and Planning announced tax reform at the end of July. PSPD agrees to low income family support and offshore leaks prevention measure but providing support to low income family would not be sufficient only by the tax reform. Most of all, it is required to have proactive fiscal policy. Imposing taxes on real estate and financial assets for the purpose of improving severe wealth inequality are not enhanced and reform of gross real estate tax is far less than recommendation made by Special Committee for Financial Reform. 80% of gross real estate tax income is from lands. 80% of this is levied to corporates and more than 70% of corporate-owned lands are concentrated to top1 %. Therefore, it is hard to accept why tax rate on land subject to special aggregated taxation is not increased. Moreover, not expanding range of subjects applicable of gross financial income tax does not accord with key policy of current government which pursues the principle of fair taxation. As facing low birth rate, aged society, lack of jobs, low growth, it is required to increase national finance including welfare expenditure which does not reach to an average of OECD members. Hence, PSPD will keep demanding that proactive financing is urgently required. As a result of PSPD’s persistent request of information disclosure and legal actions against National Assembly’s special activity budget which has been used as like a pocket money under neither surveillance nor control, issues associated with this is now broadly known to the public. It was very laborious to obtain related information from the National Assembly and PSPD analyzed breakdown of all spending and sorted by recipients. The outcome has been published in reports twice in July and August and posted on website. The main point of the analysis is that special activity expenses have not been used in accordance with its purpose and intention but paid like an allowance or regular payment for a position. The National Assembly says to abolish it to calm down public criticism but still adheres to keep some. Therefore, it has to explain and convince people where the money is required for. The volume of the National Assembly’s special activity expense is just a part of what every ministry has used including National Intelligence Service. Currently, PSPD has requested information disclosure for the expense used by each ministry and judiciary, and it presented a report which analyzed breakdown of expenses of Supreme Court and National Unification Advisory Council. It is confirmed that these two organizations have used it as like a regular allowance for a position. Fortunately, most government organizations including these two have expressed their stance to abolish or minimize. The people have to be informed where and how their taxes are used and special activity expense can’t be an exception. PSPD will keep eye on allocation of special activity expense if there is any hocus focus. Park Geun-hye administration insisted throughout the term that deregulation would develop economy and create jobs and that rhetoric is being repeated now. [Separating banks and industry Act] is at least legislation to prevent industries from making banks as their own safe and to protect financial consumers but National Assembly negotiation bodies agreed to revise [Act on Special Cases on Internet Specialized Bank] which impairs the principle of separating banks and industry. Furthermore, they said to process deregulation bills at temporary session in August which are unfamiliar to the people such as 「Regulation free zone Act」, 「Act on Special Cases Concerning the Regulation of the Special Economic Zones for Specialized Regional Development」, 「Personal Information Protection Act」, 「Service Development Act」, 「Special Act on Promotion of Information and Communications Technology, Vitalization of Convergence thereof, etc」 and 「Industrial Convergence Promotion Act」. In fact, these bills would disable or weaken current laws enacted for people’s health, environment, private information and social public interest. 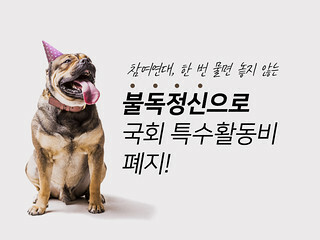 For instant, there were attempts to legislate Regulation free zone Act at the 19th and the early 20th National Assembly session but Justice Party, the Minju Party and civil and social organizations stopped it. Its’ relation with 4th industrial generation is not clear and consequences of commercial use of big data are not sufficiently discussed. There is no concrete ground that it would lead innovation growth and job creation. Revising the Act with an approach of permit first and regulate later is retrograding the law having the life and the safety of the people as collateral. Lawmakers took ages to revise Commercial Building Lease Protection Act but on the contrary, they are moving swiftly in responding to requests of large conglomerates. 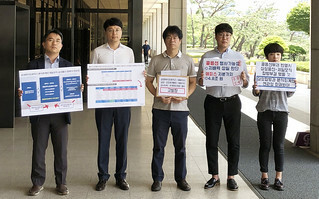 PSPD has held press conference several times to appeal one-sided deregulation both at and outside of the National Assembly and expressed the stance that irreversible bills must not be passed. What government and National Assembly have to do is not quick enactment but listening to opinions and having thorough social discussion. PSPD has brought up issues on window dressing of Samsung Biologics that it has manipulated its value to influence merger of Jeil Industry and Samsung C & T giving advantage for Lee Jae-yong to take over Samsung. Securities and Futures Commission under Financial Service Commission acknowledged and reported it to prosecutors that Samsung Biologics deliberately omitted to notice call option. However, concerning window dressing, it decided to defer the decision so that key is back to Financial Supervisory Service for re-audit. According to PSPD’s analysis on effects of omitting call option notice to the merger, Lee’s family has gained unfair profit of more than 1 trillion won but loss of National Health Insurance reached at 200 billion won. If the correct value was reflected, the merger would have not been possible. To make the merger happen, evaluated value of Samba, an affiliate of Jeil Industry had to be high, call option had to be veiled and profits had to be created by window dressing after the merger. All these illegal acts have been found by PSPD. Therefore, PSPD reported Samsung Biologics, KPMG and Deloitte Anjin LLC & Consulting for violation of Capital Market Act and others. Another thing we need to pay attention is that court acknowledged unfair solicitation between Samsung Group and a former president Park at Park’s appeal court overruling the first trial. We hope that Supreme Court makes a wise decision so that there is no more collusion between political powers and large conglomerates. It is revealed that Defense Security Command had defined candle citizens as riots and planned to oppress them with martial law who participated in candle rallies wishing to have constitutional order back. The plan was made to arrest opposition party lawmakers for violation of law making them unable to dismiss martial law. Moreover, a plan to control the press and SNS is prepared. PSPD and various organizations have reported Kim Gwan-jin, a former head of National Security Council and Han Min-gu, a former defense minister for conspiracy of rebellion preparation and abuse of power who had planned to trample the people with combat boots again. The Command has the authority to collect wide range of information and right to investigate. Adding to these authorities, it illegally watched civilian and manipulated public opinion by mobilizing online comment writers. They have to be dismantled and some functions can be allocated to military organization. However, the government said to establish Military Security Support Command which doesn’t seem different from the current Command in terms of purpose, jobs and extent of works. Furthermore, Cabinet Council made this decision within a few days. Hence, PSPD has submitted a letter against a notice of enactment and will keep watching to prevent repeating of changing only names without reform as Security and Safety Command was changed to Defense Security Command in the past. Last July, PSPD has released findings and analysis of accounting data of major three communication service providers concerning 2G, 3G service from 2004 to 2010 which were obtained by Supreme Court’s ruling. Providers have made excessive profits by setting up high coverage rate on prime cost and reward on investment up to 140%, and it was possible because government has guaranteed higher reward on investment to mobile communication providers compared to other public services. Consequently, cost burden was laid to consumers. In other word, if government set the rate 1 % lower, each person could have saved 3,000won of communication cost. Recently, Ministry of Science and Technology disclosed very limited information on LTE and analysis of this information will be released soon. While the Ministry has submitted a bill of adopting universal rate system, providers insist giving benefits to expensive package users and adopting universal rate is not necessary. In respect to this, PSPD urges the National Assembly to pass Telecommunications Business Act revision which takes universal rate system at 20,000won per month inclusive of 1 GB data and 200 minutes of voice call and its’ mandatory launch. Moreover, PSPD requested to inspect three mobile communication providers in order to check sharing personal and credit information of customers with other companies without having consent. The 22nd Youth Public Activists School has completed successfully. 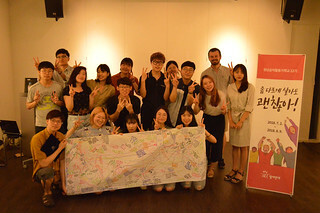 Seventeen young people have participated in the six weeks program started on 2 July and learned, discussed social issues such as participatory democracy, youth problems and civil movements and directly took actions. We would come across them somewhere sometime. 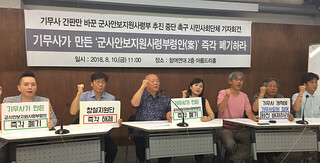 Structural corruption of Fair Trade Commission on employing retired public servants was found that annual salary was set at 250 million won for retirees who passed civil servant examination, 150 million won for no-exam background and nearly 200 million won for consultant and advisor work for large conglomerates. 12 former and current executives are prosecuted including arrestment of a former commissioner and deputy commissioner. PSPD had issued a report which investigated assets of public servants and this time, published a report on status of public servants employment restriction after retirement. As seen in the Fair Trade Commission case, it is confirmed that almost 93% of assessment have been granted. Hence, the request for public audit was filed to Board of Audit and Inspection to check if public servant ethics committee has fulfilled its job of examining employment suitability, especially for retirees from National Taxation Service, Financial Service Commission and Financial Supervisory Service which have strong influence on private companies and civil field. It is also surprising to see the result which investigated unjust supports provided for oversea business trip. Anti-Corruption and Civil Rights Commission found 261 public servants including 38 lawmakers who had received inappropriate subsidy from an organization subject to government oversight. However, the list and details are not released, and decision on violation and following disciplinary actions are all taken over to supervisory organizations and its agencies. Hence, PSPD demands Anti-Corruption and Civil Rights Commission to release all findings and requests Board of Audit and Inspection to invest directly since supervisory organizations and its agencies don’t seem to strictly execute internal investigation.